Sloggi Basic Mini slip brief - The original Sloggi for Men range, made from high quality cotton spun around superfine Lycra® fibre. 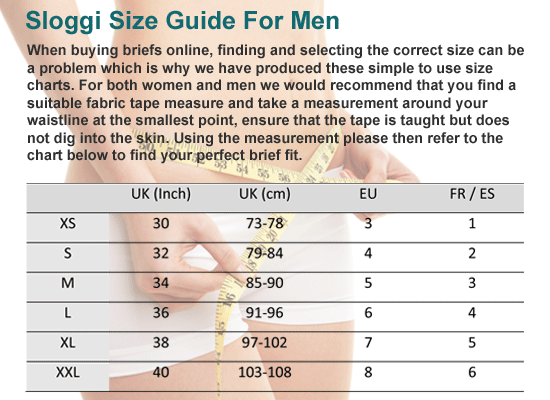 This range is hard wearing, easy to care for and a perfect fit – all the attributes of exceptional everyday underwear. All briefs also have a double layered front panel and flat, well positioned seams for added comfort. Service from the website was good. item was out of stock at first but Need Undies were excellent at keeping me up to date regarding this. My order was dealt with quickly and competently. No complaints at all, would use this company again. I've worn this product style for years - they are very comfortable. 165 of 289 people found this underwear review helpful. My order was efficiently dealt with. The product fulfils requirements for comfort, style, etc. 189 of 349 people found this underwear review helpful. my husband has worn this style of pant for years. he is 50. He finds that their style the best for comfort althouth the waist band is slightly narrow snd rolls over easily when he bends. 214 of 443 people found this underwear review helpful. Great product very comfortable great buy. Sloggi, dont wear anything else. 242 of 488 people found this underwear review helpful.